You’re struggling to keep up with demand. Your company has responded by rolling out new product lines, opening new divisions, and beefing up the marketing department - which is sending your team more leads. You need to scale up the sales function of your business while meeting a series of ever-increasing revenue growth targets. This is a fun challenge to attack, but the pressure is real, the stakes are high, and there are no do-overs. Or this new influx of leads and demand cripples your productivity. Problem is - you can go wrong in two big ways. Managing one sales unit is difficult enough, but managing multiple teams during a time of growth can feel like an almost-overwhelming challenge. You have to make sure all of your teams are aligned with one consistent sales process and you need supportive technology to grow with you. You also have to find the right new people fast. You can’t just put butts in seats — somehow you have to find superstars that will stay true to the culture that got you here in the first place but also cope with the pressures of smashing ambitious growth targets. Then you have to onboard these new team members. Fast. You can’t afford bureaucratic mess, expensive consultants, or time-consuming training. You need new starters adding value immediately. You might feel like you’re about to drown at this point, but you can’t let your teams see you paddling frantically below the water. Morale must stay high amidst the change and uncertainty. It’s your job as a manager to keep your teams motivated to try and surpass previous goals. Even if you’re just managing one fast-growing team, all of this can mount up and begin to feel like mission impossible. You can lift that burden of stress with the right combination of a scalable, hand-off-able sales process and supportive apps to help you continually optimize, prioritize, and strategize. We know because our founders and our sales managers have blazed a trail through these same conditions before and come out the other side to tell the tale. And with the help of Pipedrive’s very own team leaders, we’ve put together some helpful, practical insights you can use to navigate this intimidating, but exciting challenge. We want to help you build a system to grow your sales force in a planned, consistent way using a combination of scalable processes and essential software. This article will guide you through the structural foundation you need to scale up and dominate. You’ll be pouring the concrete for an impenetrable base. Without this steady footing, you risk building too fast. Number one is undoubtedly the most important. Before you even begin hiring new reps, you need repeatable sales process in place if you plan on scaling up effectively. If you don't have a process outlined, then you’ll find progress hard to measure and almost impossible to track. You need accurate data to make informed decisions. If you’re not able to track results effectively, you’re really just making educated guesses on how to allocate your sales time efficiently. So you're going to need a simple, structured, and repeatable process that helps all reps understand exactly what they need to do to succeed. Your process should be accessible enough that new hires can jump into their new role and know what activities they need to complete to add value and hit revenue targets straight away. 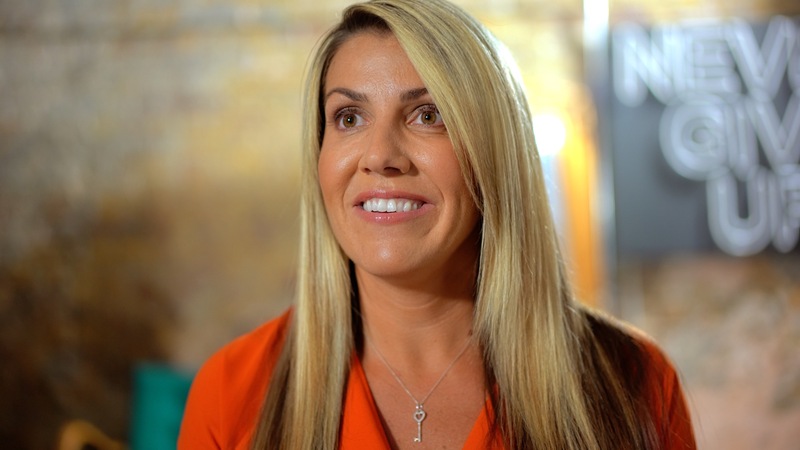 Mandy Cole is the former VP of Sales at Zenefits who’s built and scaled sales teams at several companies including LivingSocial, MyNewPlace, Main Street Hub, Stella & Dot, and Citysearch. Mandy has seen too many companies hire salespeople and expect them to just ‘figure it out’ on their own. So how do you set up this scalable sales process? We’ve prepared several instructional guides to help you develop, refine, and implement a scalable sales process to empower a growing sales team. As you set up a scalable sales process, you need to factor in the way you train, teach, and measure the success of your growing teams. Which leads us right into the second pillar of your scaling strategy. A scalable sales process gives new reps focus by clarifying the exact activities to complete during a sales cycle to generate the best possible performance. You cannot control results, so you shouldn’t stress your growing team by tracking raw numbers alone. Instead, you need to focus on what they can control - their activities, as well as measuring results to assess performance. Your job is to optimize your sales process and tweak the flow of activities your team needs to complete in an effort to continually maximize sales. Here’s why this tried and tested philosophy works so well for companies looking to scale up fast. When salespeople (especially new reps) stress out about their targets, they often panic and diverge from a set sales process in a desperate attempt to hit their numbers. Activity-based-selling keeps reps focused on what they should be doing now, rather than heaping pressure onto the chase for quarterly revenue targets. As you scale, it’s harder to keep team members aligned. If every rep starts using their own, unique process, you’ll find it harder to track and, consequently, optimize performance across the business. By focusing everyone on the same activities, you can easily measure and monitor your sales process as your organization expands without constantly checking in on new reps. If your newest team members are successfully completing their activities, you know the process is scalable. If not, you can pinpoint the faulty areas of your process. If one rep alone is struggling, there’s a good chance it’s not your process at fault. You can help that rep with individual training, mentoring, or a specific performance improvement plan. You’re not just throwing reps at the work and telling them to meet quota. This ‘sink or swim’ mentality is not scalable. You should be able to plug a rep right into an activity-based sales model and start seeing results almost immediately. There is no confusion over their role or the way to execute. This is so important when you’re growing fast. If new hires deliver what is in their control, results will come. A looming revenue target without a plan to achieve it can be emotionally daunting. Your sales CRM should help you automate annoying, time-consuming, manual tasks. The bigger you grow – the more time this administrative burden will steal away from your team. Get that scalable sales process in place before you make significant decisions about which apps and platforms your company needs to sustain success. Scaling up requires exponential growth. A clean, repeatable sales workflow should allow you to hand-off to a new sales rep easily. Your sales CRM should support this. You can’t afford to add extra chores and frustration to a busy employee’s workload. You probably can’t afford to pay an expensive consultant to spend weeks training your team how to use your new system either. Is your average new hire going to be comfortable using your CRM? Can you afford to spend the time and money required to onboard and train new reps on your tech? Are your existing reps using the technology properly? ✴️ Bonus question ✴️: Is your CRM data compromised by incorrect or missing data? Fast-scaling companies need a CRM designed to help big teams close more deals on the frontline. If your team sees your CRM as a pain - you’ll end up with inaccurate or even non-existent data. This throws your tracking, forecasting, and reporting into chaos. You need a tool that eliminates as much administrative work as possible to make sure your team spends more time on sales activities. You also need a system that simplifies your salesperson’s job. You want to complement your activity-based-selling approach with a CRM that prioritizes the rep’s workload and notifies the user of the right activity to take at the right time. This quick two minute explainer video shows you how a CRM can help a salesperson save time rather than add more administrative burden. You won't need to spend as much time training your new hires with a set process in place. New reps (even the least experienced) will be able to start delivering within days with the help of your structured process and a simple, intuitive CRM. It will make your life easier too. You will have a consistent process to track with clean, accurate data. You can draw better insights to inform the decisions you make on the future of your business. Both process and reporting are critical, according to Brandon Crawford, director of partnerships for SocialChorus. When you're working with a small sales team, you can check in with each of your reps personally. You can ask them what they did today, how certain prospects are progressing through the pipeline, and where they're struggling. This is a simple, high-quality approach to managing a small team. You can't personally check in with 30 salespeople on a regular basis. Even with small teams, employees can hide problems and charm their way through a meeting with the boss. But data doesn’t often lie. Tracking has to be the best friend of any sales manager trying to scale up fast. When you have a scalable sales process using the activity-based-selling approach, your reps know exactly what they need to be doing. When you've got a CRM that helps your salespeople easily log their daily activities, you know what everyone on each team has been doing. Pipedrive’s Platinum plan has a Teams feature specifically designed to help sales managers better analyze team performance. When you create a clear sales process, and identify simple key performance indicators for your team, you can use that information to accurately identify trends and make smarter decisions on how best to scale your sales team. 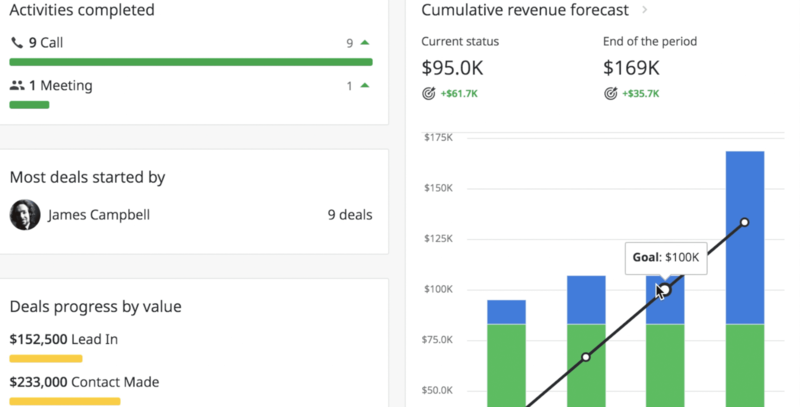 The Cumulative Revenue Forecast report on Pipedrive’s Platinum plan will give you a simple visual snapshot of overall performance and help you improve your decision-making. Similarly, you can spot positive trends and double down on what’s working. The Teams feature gives you a quick, visual overview of individual teams’ sales activities and performance. You can monitor performance of one salesperson, one team, or multiple teams - in one convenient, visual snapshot (much better than lurking around the office to see who is constantly on the phone and who has taken a long lunch). You don’t even need to be in the same building to know who is making calls all morning. You know who's gotten stuck on a prospect that's unlikely to buy. You know if someone keeps missing follow-ups. And you know which team is constantly struggling at the final stage of their deals. This level of visibility lets you compare your sales teams. Say one team is consistently hitting targets while another is falling behind, with quality data and clearly defined metrics, you can pinpoint where the problems lie. You can also spotlight teams and reps who are dominating in this area and find out what’s working to double down on their success. Managing fast growth based on your experience and instincts carries the risk of leaving you vulnerable. You need to rely on insights drawn from data to support your judgement. Data without insight is useless. But similarly, ‘gut feel’ decisions will leave you gambling with your company’s future. Pipedrive Platinum lets you calculate a revenue forecast based on your deal values and your expected close rates. With a scalable sales process and an activity-based-selling approach, you can be confident your team is entering consistent and accurate data. You know you have an accurate predictor of the future. This is what you need to bolster your experience and judgement. You can make informed decisions on the best way to scale up successfully. Develop a clear, repeatable sales process: Building a consistent sales process is the single most important thing you can do to set your team up for lasting success. Provide a clear roadmap for every rep by specifying activities to focus on at every stage of the sales process. Implement activity-based selling: Don’t focus on goals, focus on the activities your reps need to do to achieve those goals. That takes pressure off the reps and gives you metrics to track. Optimize with regular tracking and forecasting: Use the CRM to keep an eye on your sales team’s activities. Constantly monitor progress toward your revenue goals. By tracking and forecasting often, you can see where your process is breaking down, and adjust it accordingly. Make proactive decisions on scaling up: The best managers get out in front. You need to prevent a problem before it takes root. Use the key performance indicators generated by your sales process and your CRM to predict and address any issues on the horizon. That’s how you navigate the journey fast through the inevitably treacherous waters of scaling up fast. Use insights to make tough decisions: If you’re constantly tracking metrics, you’ll start to notice patterns in the data. Trust those patterns, and, when you get data that points to a problem, investigate immediately — even if your gut says otherwise. Already a customer on Silver or Gold plan? Go to Billing and activate your 30-day Platinum trial (at no additional cost). If you like it – keep it, and you’ll only start paying for Platinum at the end of your 30-day trial. For a full comparison of Pipedrive’s subscription plans, see features and pricing.